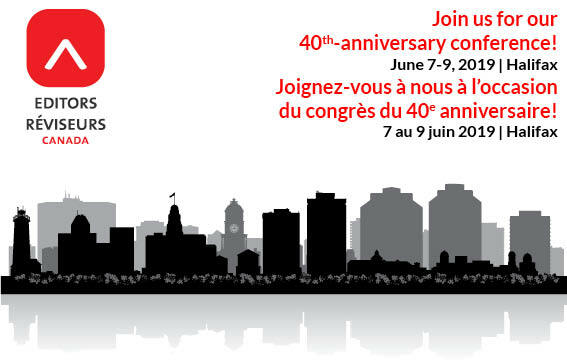 Editors Canada promotes professional development opportunities for editors and other communications professionals at its annual conference, held each spring. The weekend event offers 30 to 40 programmed sessions spread out over three days, which are led by experienced presenters and panelists from across Canada. Speakers include representatives from both print and online publishing as well as government, corporate, and non-profit communications experts. The Editors Canada conference is open to members and non-members alike, and all attendees can take advantage of networking opportunities, be it renewing old acquaintances or making new ones. Attendees can partake in conference-related events beyond the sessions themselves, such as the opening and closing keynote speakers, a vendor fair, a welcome reception, and an awards banquet featuring presentations of prestigious Editors Canada awards: the Tom Fairley Award for Editorial Excellence, the Claudette Upton Scholarship, the Karen Virag Award, the President's Award for Volunteer Service, and the Lee d'Anjou Volunteer of the Year Award. In addition to these events, attendees can also step away from the conference venue and enjoy programmed social gatherings and evening events celebrating local experiences and culture.